I have a love/hate version with technology, specifically with my iPhone. I love how it can connect me to all kinds of information anytime I want. But sometimes I hate the pressure of feeling like I always have to be connected at all times. My brain is starting to function very much like my current iPhone, which is actually no longer very current and definitely needs an upgrade. Honestly between all of the social media I feel like I can’t keep up with responding, both socially and professionally, in an intelligent and meaningful manner. Much like my phone that is overstuffed with photos, my clothes are becoming overstuffed with, well, me. Too much pizza, too much wine (Damn you summer rose`), and too many cookies. Those are my favorite three things to eat and drink and I am pretty sure none of them are in the food triangle that gets pointed out to our kids at their well check. I know what I need to do. I need to take the time to purge the photos off of my phone (I have 12,092 and 83 videos as I type this right now) and onto Dropbox or iCloud or one of a million other options but, I’m lazy and haven’t taken the time to figure out how to do it without accidentally deleting or sharing everything. And I need to hire someone to follow me around and smack my hand whenever I reach for pizza, cookies or wine. There are two types of people in this world. There are those that just have a picture of their battery in the form of an icon in the corner of their screen, and then there are those who have the actual percentage rate of battery charge posted right next to the battery icon. Guess which one proves to be more stressful? Those of us who have the number posted can’t fathom how the rest of you can function. It is like the gas tank in your car just showing a level but no actual mileage or numbers. I so wish I could be laid back and not stress when I see that battery going low, but, if I am being totally honest, I start to freak when I see my levels go under 50%. I panic because I have no idea what the rate and speed of depletion is. We have all looked at phones and thought, “Hey I’ve got 57%, I’ll be fine.”, only to look down 30 minutes later and see that awful RED battery with a single digit percentage. Lately my brain feels the same way. My energy drains at an inconsistent rate. Somedays I get up and can get a million things done and feel great. Other days I feel spent after simply getting the kids off to school. The one thing I know for sure is after too many social events my battery plummets and I need to be home, alone, staring out at the trees in my backyard, usually eating cookies and drinking rose`. This has to happen immediately or I will shut down and cease to function at all. My introvert self needs to recharge BEFORE the battery turns red. When we realize our phones are running low on battery and on storage we immediately check to make sure we close or delete any open apps that we aren’t using. Wouldn’t it be wonderful if we could do that in our brains? This is where yoga and meditation are really as important as everyone tells us. They allow us to close all the noise of all the thoughts that are going simultaneously inside our heads. “I need to make the kids dentist appointment…when was the last time I was at the dentist…do I need toothpaste…I know I need to pick up that prescription from the pharmacy…when I go to the pharmacy I should grab a birthday card for that party my son is going to…did I rsvp for that party…oh and what can I get for a gift…what am I going to do my kids’ birthdays this year…oops red light I thought that was yellow…SQURRIEL! ” When our brain has too many apps open we are not present and that is when we do things like leave our wallets on top of our cars or bang our toes into doorways. Not good stuff. And sometimes we just have too many apps, as in you don’t even know what they all do and if you need all of them anymore. People who are really helpful tend to say yes to everything and the next thing you know they find themselves involved in an overload of activities and obligations. Sometimes you just have to look at all of them all together and see which ones are sucking up the most data and draining the most battery. Often times we don’t use all those apps or things in our lives. When our phones start to get old we start to notice that they are not charging as fast or effectively as before. Sometimes it’s the chargers themselves, the cords get too bent, the ports get dirty, and sometimes it’s just because the phone needs and update. Most of these nagging update messages pop up and we generally hit the Later option which tells us that it can do the update overnight as long as it is plugged in to charge. Sounds simple but how many times have you fallen asleep without plugging in your phone? If the phone isn’t charged properly it can’t update. Well neither can I. If I don’t get my downtime or a good nights sleep I can’t seem to prioritize the things I know I need to do to upgrade my life. Exercise, eating right, making time for friends all feel like things that slip further out of my reach if I haven’t been able to properly recharge. And the more I put off the updates I so desperately need, the further and further I get from trying to effectively reach my goals personally and professionally. And how many of us put off the update for fear of it changing what is familiar to us? Sometimes we repeat a negative cycle simply because it takes less work than consciously changing a bad habit. We all fear change but usually it creates growth and something positive. This will require me to swap out my cookies and wine for carrots and seltzer, which I have been putting off even though I know I need to do to feel better. I think there is a bit of a rebel in all of us who hates being told by our phone what to do. I don’t want it to tell me I have to install an update. I want to decide and be in control if I want the update. This is so childish but I am very guilty of not always wanting to do something that is told to me rather than asked of me. Stupid and stubborn but I’m working on it. I think Apple needs to work with reverse psychology and tell me not to the update and then maybe I would…totally messed up. Well this one isn’t fun. Who has left the phone out in the sun on a hot day, or maybe even in your car? Of course this happens when you need it the most, not like a clown with a bloody knife is chasing me emergency, but more like I need to use the phone to get directions type of emergency. Well again if you are a female over the age of 40 you probably know what it feels like to feel overheated and it ain’t fun. Sweating into your sheets and adding to your mountain of laundry isn’t a great start to your day. Plus when you are overheated you don’t sleep well which means you can’t recharge your battery which creates to our overall slow overall performance. There is only one cure for this one and that is to give you and your phone a chance to cool down. I also recommend lowering your thermostat to 65 after your husband goes to bed and buying these moisture wicking pjs from Soma. Sometimes you do all that you can do and then it is just time. You need to upgrade your phone. There is a famous quote about the definition of insanity is doing the same thing over and over again while expecting different results. I am totally guilty of this. Sometimes we just need a new phone. While we can’t just run to the hospital and ask for a new brain, (which of course we would back up first to make sure we could upload all of our memories and feelings), we can make some changes to our outside. We are often told we need to feel good on the inside so that we can look good on the outside. While I do believe this I also believe that we need to both feel and look good. And sometimes these may happen out-of-order. Sometimes a person has done all they can do internally but things just aren’t changing for them in their mindset. That person may just need an extra push and that extra push may come from changing the outside and working in. Sounds confusing but hear me out. I know clients who have lost weight, been through a divorce, or just generally felt insecure or struggled with self-esteem. They are stuck with a voice inside their head that they are desperate not to hear. When someone compliments you how do you feel? It can be something as small and simple as “I love your earrings!” and the next thing you know that person is standing a little taller, holding their head a little higher. I can’t tell you how good it feels to get to know my clients, to understand them and to see their beauty, and then to able to put them into clothing that reflects what I am able to see on their inside. When we feel pulled together on the outside it helps us to feel pulled together on the inside. When we feel pulled together inside we can act pulled together, resulting in a positive shift. Let me be very clear in that this is not a makeover. That would be like trading in your phone and never copying over any of your previous contacts, apps and information. There is a reason when we get a new phone we first connect it to iTunes and reload our backup info. There is comfort in seeing all that information and apps come back up into this new phone. Now we are in the position to edit what we want to put on the phone, so instead of deleting apps and information we get to choose what we want to add in. This is exactly what happens when I first meet with a client and help them go through their closet. I hesitate to use the phrase “get rid of stuff” when I prefer to think of it as choosing what we want to put back in. What items work for their life RIGHT now, fit them RIGHT now, and make them feel good. When you fill your closet back up with the good stuff then you can put together new outfit combinations out of your favorite things, sometimes the clients hardly have to buy anything new. This is kind of like when you finally check with your phone provider and realize you are actually eligible for a free upgrade or that it will cost you very little. Sometimes a client may need just a few key pieces, like jeans in an updated rise and cut or shoes that in line with what’s currently in style, and then they can mix them back into their wardrobe and upgrade. Upgrading is a good thing. It means that it was already good but that it can get even better, just like us. Special Delivery – Jewels delivered right to your home! March 1, 2015 March 2, 2015 by suziegaffney1 Comment on Special Delivery – Jewels delivered right to your home! For a monthly subscription rate of $48 a month you receive a box of goodies delivered right to you. No need to stress over which ones to pick out because all of that is done for you. You get 3 pieces, (necklace, earrings and a bracelet) wrapped up like birthday gifts just for you. That’s it! It’s that simple! The very best part? You don’t have to stress over running out to go shopping or worrying over making a selection. 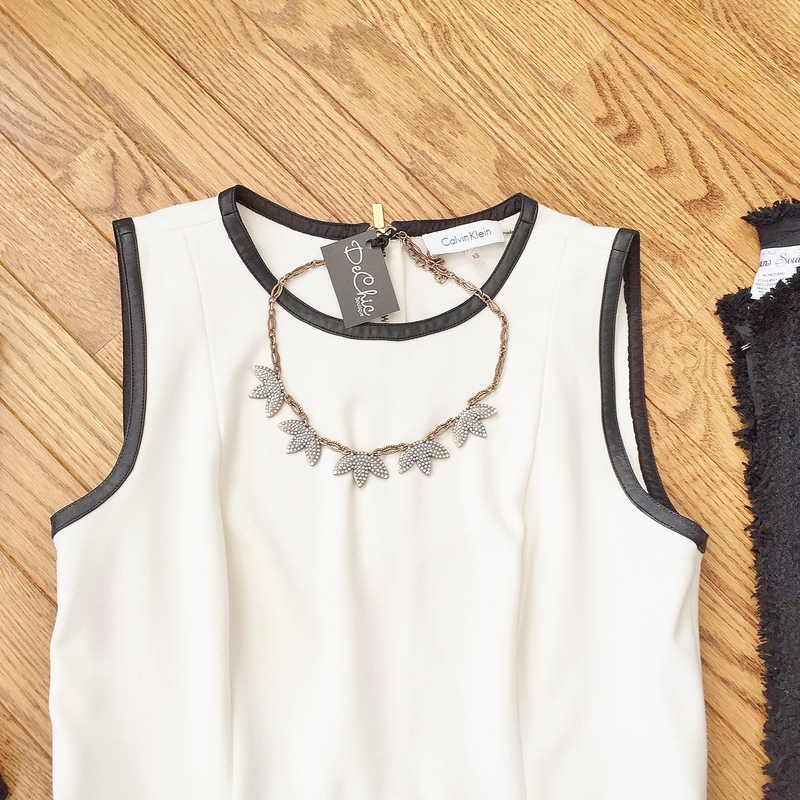 All that’s left is the fun part – incorporating your new pieces into your wardrobe! Below I show 3 very different looks, all with the same necklace and the same pair of pants (the J.Crew Pixie pant with leather). Featuring my favorite new purchase, a Chaser tank from Chantilly Blue ( you will be seeing me post a lot of outfits based around this top, I’m obsessed! ), paired back to a casual denim jacket and my glam version of biker boots. Here the necklace softens the edges up a bit and adds a feminine touch to a more rocker look. 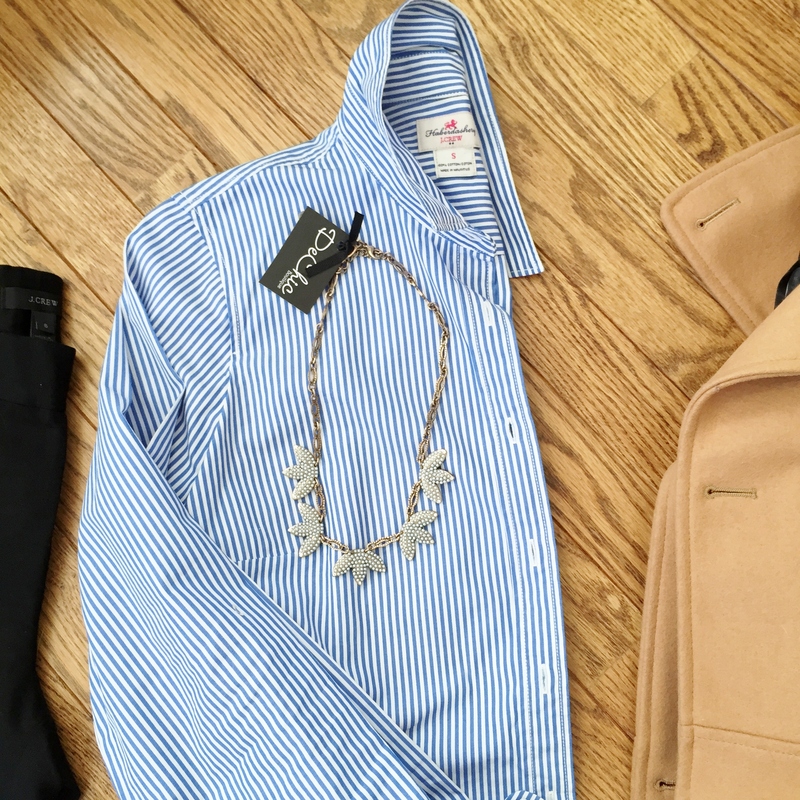 I paired the necklace with a classic striped button down, camel jacket and black heels. Perfect for anywhere from a PTO meeting to a CEO meeting. The necklace adds just a touch of softness and interest to what could be boring business basics. Whether it’s a Friday first date kind of night or get together with your favorite group of girlfriends, this look is super simple and works at a bar or a bistro. Simply swap the top for something a little more fun, (in this case a peplum tank) and a statement jacket in sequins. Add glittery heels (from Ashley Austin) and you are all set! Worried this necklace only works for black pants? Definitely not. The possibilities are only as endless as your own imagination. That is the best part about jewelry. Even if it is considered a “statement” necklace remember that since you are the one wearing it you get to choose what statement you are going to make. Rocker? Bohemian Chic? Preppy? Classic? You are in charge of your look. *Insider Tip – Start with the jewelry. So many times when I go to help a client with the contents of their closet they tell me that they love jewelry but struggle with making it work into their existing wardrobe. The solution is simple. When working with a necklace/earrings/bracelet that stands out try to create your outfit around that piece. So often what happens is a women looks at her closet, picks out her outfit, and then tries to make the jewelry options work into her existing outfit. This is actually much more challenging. Generally we have more clothes than jewelry so we need to go in the other direction. Much like when you are decorating a room, it is so much easier to pick a paint color after you have chosen a fabric as an inspiration. Have you ever tried to go pick out a comforter after you had painted the walls? It is super challenging to find one that fits the particular hue of the paint. However, when you work the other way around you will find there are infinite amounts of paint colors to go back to your chosen comforter. Picking out a piece of jewelry makes it easy to choice simply solids and textures to compliment and showcase a beautiful accessory. It also helps you to pull together pieces you might not have put together before. Saturday night we had a date night with some friends. A few weeks ago I found a beautiful Nanette Lepore silk top at Greene Street Consignment in West Chester, but I had yet to wear it. 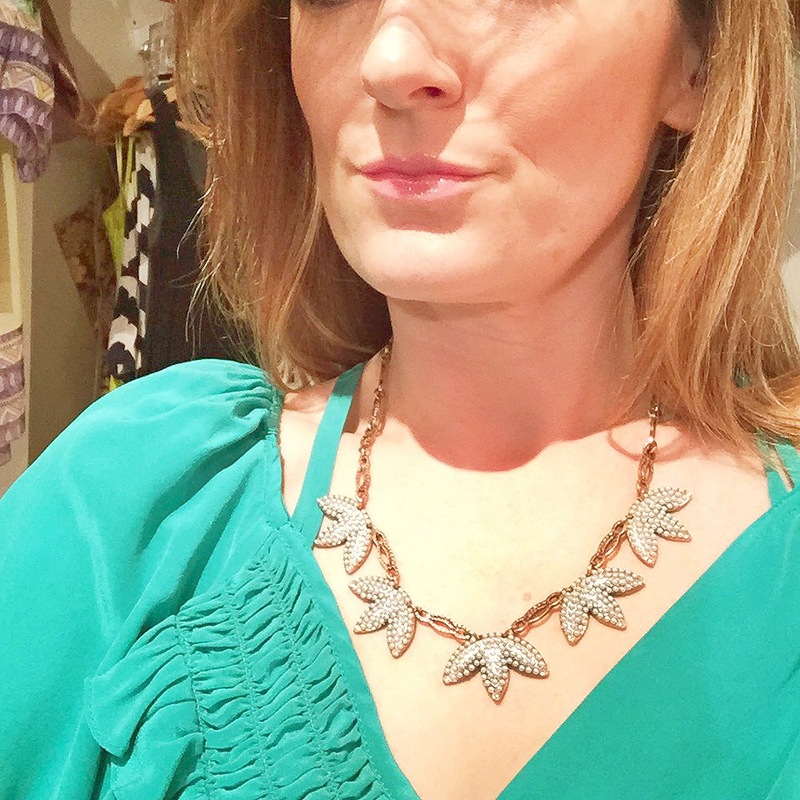 Having received the necklace the day before, I was excited to wear it and I realized it was the finishing piece of jewelry I needed to compliment the color and neckline of the top. Mission accomplished! Need help mixing and matching? I’m here to help..contact me to “shop” within your own closet. 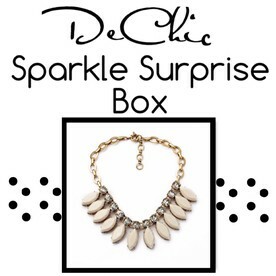 Sign up for your Sparkle Surprise Box by DeChic and I will come over and create new looks based on your new jewelry.